Under attack: But Jeremy Corbyn has said and done nothing that any rational UK citizen could possibly find objectionable. There’s a paragraph in this article that states the right-wing Labour assault on Jeremy Corbyn is not about having a rational debate but about preventing it. That is a comment that corresponds exactly with This Writer’s experience, having engaged, on Saturday evening, in a discussion with a supporter of Kevan Jones who absolutely refused to pay any attention to rational arguments about that gentleman’s behaviour at all. It seems likely that similar scenarios are being played out around the country and I may blog the conversation as an example of the lack of reason that seems to typify these people’s assertions. thoroughly enjoyed and benefited from reading all your posts these past several days, Mike. Keep ’em coming….thank you. They should be experts at this after all the practice they had using exactly the same tactics during the Scottish Independence Referendum campaign. I don’t recall much by way of personal attack by Labour in the IndyRef campaign. But them as so many SNP supporters are fond of chorusing, I wasn’t actually there. My personal recollection, as a bystander, was that most of the name-calling was by the SNP and its people, who seemed very desperate to claim an imagined link between Labour and the Conservatives. Yes – that Labour and the Tories were bosom buddies, just because they were campaigning on a common cause – keeping Scotland in the United Kingdom. Labour MPs have since admitted that joining the Tories in the Better Together campaign was a mistake, simply because it allowed the SNP and the ‘Yes’ campaign to suggest such a situation. Well said Mike though I think evidence for your headline is still sketchy – the popularity of JC compared to the other leaders (and it is “popularity” no matter what the nay-saying misinterpreters want to say – if you strip out the “all politicians are useless” responses, Jeremy is 19 points clear of Cameron in the latest leaders poll) – but there are still bad voting intention polls coming out – and our opponents of course pounce on the worst of them with glee. Here’s an interesting question though – if Jeremy Corbyn is more popular with voters than David Cameron, then why a more people saying they will vote Tory than Labour – it *can’t* be anything Jeremy is doing, or he would not be so popular – so it MUST be something someone else is doing – like those people who are constantly disrupting their own party because they don’t like the democratic decision of the members. The party is shown as divided, and therefore less electable, *precisely* because of their efforts. I’m not sure what you’re saying about my headline – it doesn’t refer to his popularity at all and your comment agrees with what it’s saying – that people are catching on to what’s happening. Mike – just saying that I agree completely with the content of your post – but I don’t see evidence/examples *in your post* of “more and more members of public and media (twigging) what anti-Corbyn Labour MPs are doing. Maybe I’m mis-reading. Other than in your headline I *believe* people are cottoning on – but the evidence is a bit thin on the ground as yet. Would love to hear of any examples you have as it is a worry. This was a report about another article in the media criticising the anti-Corbyn brigade; I was saying that these articles are starting to crop up more frequently (they are) and that means more people are realising what’s going on. Have a look around – hopefully you’ll see what I mean. Greece is a completely different country! Do you have any facts to support your bald statements or is this just more Tory posturing? 19 points ahead great news Cos eh ???? What you see in Greece is the results of socialism. Leftists are good in telling the people not to work and demand everything for nothing. This is why Greece collapsed and this is what the leftists want for Britain. But the people in Britain have not completely abandoned the work ethic as in Greece. This is why socialism is not popular in this country and it will always be that way. No worky no eaty. I don’t think there’s any rational argument against this because your entire comment is absolute and utter rubbish. Where’s the evidence to support any of this, other than in your head? Socialism revitalised the UK after World War Two, in case you have forgotten, building the longest-sustained increase in living standards ever seen in this country. That was founded on hard work. It was only when the neoliberal Conservatives gained office in 1979 that living standards started to fall. They engineered the closure of the UK’s industrial base in order to make working class people insecure, and they created a large underclass of the sick and unemployed. There is factual evidence to support those claims. You can look it up. And don’t come to accusations like “this is the Daily Mail”. Yes it is. The Daily Mail, the most popular paper in the UK. Do I read it? Do I like it? Of course no. But this is the truth. No matter if you like it or not. Truth is truth. “Truth is truth”, is it? If you want truth, join the Church. Any one will do. Newspapers are supposed to deal in facts. See my article about Miliband for a more accurate depiction of his stance. Erm, ‘Cos’, read Pilgers excellent article on Syriza, in which he makes it clear, going on policy decisions, going on legislation passed, they are NOT left wing. They are, if anything, centre Right, and have much more in common with the Blairite/Cameron style of govt than anything the left would introduce. These days the press label anyone as ‘left wing’ and ‘extreme’ if they even dare to suggest that Austerity is not the be all and end all. A quick look at the terms Tsipras ‘grudgingly’ accepted from the EU should give you a clue to where he and his party’s true sympathies lie. Nice try Cos, but check your facts before telling us anything about supposed ‘Socialists’. The right wing of Labour don’t seem to either understand or believe in democracy as far as I can see ! they don’t accept that a huge number of members voted for Corbyn and that by going down this route they could destroy the party altogether…… but they don’t appear to care either and they are just proving what they are.. right wing neo Tories, how did they end up in the Labour party in the first place??? it’s beyond me! How long it will take until Corbyn will be ousted from the party? A month? A little more? And this is how the story ends. Just get over it lefties. The people DO support austerity en masse. Prepare for a disappointment. Corbyn isn’t going anywhere. Corbyn will be ousted once new polls will show the party polling in the tartars. Accept it, in Britain socialism is over. The majority supports the cuts. No, I won’t accept any of your nonsense. Away with you. Great article Mike. Thank you……IMHO…Western media is being used as a weapon against we the people, by the established power base…….how can we have “democracy” when what we are being told by the mainstream media is largely being spun ? (or not told at all)……..which is a polite way of saying they are lying, manipulating b*****ds….lets call it what it is…….we dont have democracy, we have corporate puppets masquerading as politicians. The question on most everyone’s mind is, “is Jeremy Corbyn for real ?” I would like to think that the frenzy to oust him is more evidence that, yes, he is a man of the people, not of the corporate machine. So our mainstream media is weaponized, then lets bring it down by opting out and calling it out where you see the lies and spin. Wake up your friends and family………give your time and attention to media that makes sense ! I can’t comment on that, I’m afraid. Absolutely agree. After all, why should they change this plan as it worked so well with Ed Milliband. The only difference this time is the blatant manner in which they are carrying it out. Which brings me to general election prospects for Labour, and the “Corbyn bubble” mentality. Where does Labour expect more voters to come from? The centre? That’s Lib Dem stomping ground now, Corbyn surrendered that on day one. Wales? nope, turning UKIP… Scotland? Hell no, gone SNP… Northern England? UKIP pushing in every seat… Manchester, Birmingham, London? Even postal votes only carry a party so far…. You seem to support UKIP. Why, then do you also seem to applaud the return of left-wing politics to Labour? The two are mutually exclusive, you see; UKIP is right-wing party – more extreme than the Conservatives. Labour is winning back the people who didn’t vote in the general election because they didn’t see anybody worth supporting. If you’re thinking only about those who did vote, you’re discounting around one-third of the electorate. I nearly laughed out loud when I read your suggestion that the Liberal Democrats have any “stomping ground” at all, let alone the centre ground. Where IS the centre ground nowadays, by the way? Over to the far right, where UKIP puts it? Contradiction in terms, isn’t it? And there’s no reason Labour can’t win back voters from the areas you discount. Wales isn’t turning to UKIP. I live here and can promise you that. Scotland went to the SNP in May but there’s no guarantee it will stay that way. Labour will win in Oldham, by the way. And in the Welsh Assembly. And your reference to Dan Jarvis as ‘moderate’ is the kiss of death. Even if he corresponds to the dictionary definition, the Labour ‘moderates’ have ruined it for anybody who does. The stupidity of the Labour Right is that if they should succeed in a coup, they will have destroyed Labour’s chances of an election victory in 2020. The members who flocked to Corbyn and many people who have watched on PMQ’s having not been involved in Labour’s Leadership battle will be so disgusted with the Labour Right that they will turn away from Labour completely. The number of voters who will vote Labour will be decimated by the actions of these right wing Blairites and Labour as a party will indeed cease to be an effective alternative to Tory. The Socialist Parties will see a huge rise in their numbers and will form a new party just as is happening in France, Germany and several other EU countries. What fools these self serving Tory Lite privvies are, such a shame we cannot get rid of them and have our Labour Party back. Personally I think that too many of the self serving Labour right wingers will worry that people will turn away from the bickering Labour Party and opt to back JC in an effort to present a united party as opposed to this fractured “non” party. Otherwise I predict it as “curtains” for the LP. As far as the Tory Troll assigning all those who support JC as “lefties” – I voted Tory from ’72 to 2006, Lib Dems in 2010 and would have voted Green 2015 had there been a candidate standing because of their approach to an economic and fiscal agenda. I would vote for JC providing McDonnell can introduce the economic strategies outlined in Corbynomics. How does that make me a leftie? Perhaps economics is not the strong suit of the Tory Troll Twerp? Call me a pragmatist instead, because I would pursue an economic solution that would benefit everyone, not just the already privileged rich. The people do not want austerity? Are you sure? Yes I am sure. If you had read the article, you would have seen that the poll it mentions is discredited for asking skewed and leading questions. Look at the massive vote for the SNP in Scotland – a party that campaigned on an anti-austerity platform and for which many English people said they would have voted, if they’d had the chance. I don’t believe the SNP was being altogether honest – for reasons I’ve already explained in previous articles – but the response from the public is overwhelmingly clear. Jeremy Corbyn offers the only chance of life to millions threatened with death, especially now the cold of winter has hit. The Basic Income policy alone, already being tried in Holland and mooted for Finland, ends the threat to life of the conditional benefit system being so thoroughly done by the Tories. The Basic Income ends starvation caused by sanctions many months long even tot he most vulnerable and babes in wombs to grannies, when medicine knows we starve to death in, on average, 6 weeks. Jeremy Corbyn is rent controlled social housing, not leaving the homeless on the street to die even at 82 years of age. Labour under New Labour’s Miliband lost 23 million working class income voters. There are 2 million poor pensioners on the breadline. 13 million in dire poverty. New Labour believes in austerity which has always killed the poor wherever in the world it has been tried, and never solved a recession. As Gandhi observed, People’s Politics are Their Daily Bread. The hatred of the disabled as benefit scroungers getting worse by the day, from verbal abuse to physical assault even to those in wheelchairs, would end with the universal and automatic Basic Income for all. Jeremy Corbyn is a life saver to millions. Who cares about Middle England’s selfishness. Benefit and state pension cost nothing. Proven by state pension at 60 for women since 1940 and the beginning of the welfare state 1945/1948, when UK had massive war debt. Yet UK went on to an age of prosperity. I am trying to debunk the myths that the Tories put forward and New Labour agreed with, with my Facebook page of posts to show we are all taxpayers, in or out of work, pensioners. I take it this is directed at Blairites rather than This Writer. 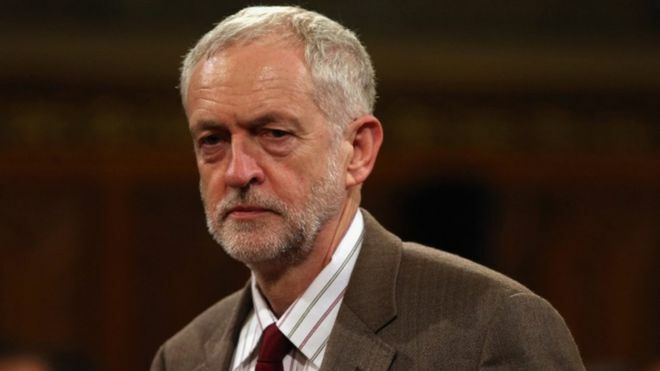 The right wing agenda against Corbyn has failed, everyone knows what they’re doing and are appalled by it, they got away with it in the beginning but the continuous onslaught against him showed it was just blatant bullying from the right and the people saw this and became disgusted by it so their plot failed and now it’s time to shut up and move on, your scheme failed, get over it!